The M97 is as basic as a detector gets. It goes beep, you dig it up. No discrimination, so lots of metal dug. It might be fun on a beach but in most places it will have you digging too much trash. 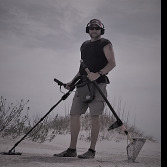 It will be fun to learn about metal detecting using it, especially as Steve has said at a beach on the dry sand where digging is easy and causes no damage but you would quickly want to upgrade to something better with discrimination that can tell you if a target is ferrous junk or non-ferrous. That detector won't work on the wet sand. 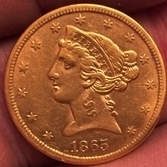 You can move up to detectors that can give you a good idea of what's under the coil with their Target ID numbers, to the point you can be very confident a target 10 inches down is a specific coin. I'm sure you and your grandson would love metal detecting but a detector like that is probably going to disappoint you unless you don't get disheartened digging a lot of junk. Fortunately really good detectors are going quite cheap at the moment, prices have fallen a lot over the past couple of years due to intense competition. Don't be shy asking questions, there will always be someone here know the answer for you. You could look at one of the Garrett Ace machines with the DD coil. The Concentric picks up too much trash as the Rx is too large. Also Whites Coin Master is also a pretty nice machine. I would avoid a machine that has a needle for the target id as they are so slow responding it is really difficult to pinpoint or even know what it is doing. I had one on my old Bounty Hunter and found it to be annoying at best.